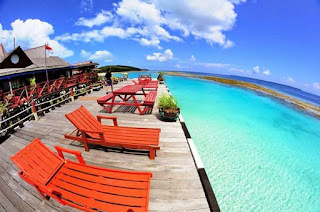 Invited the Ministry of Tourism, 16 travel agents from Australia invited around Derawan Islands, East Kalimantan. Maratua is the most special because practically similar to the Maldives. Yes, the beach Madura dubbed the island paradise (paradise island) because of her beauty. Like this was the one they regard as Maladewanya Indonesia. Familiarization Trip in the series of Australian Travel Agent of the Ministry of Tourism, followed detikTravel, on Saturday (23/4) until Tuesday (26/4), they toured many destinations and perform various activities on the islands Derawan, Berau, East Kalimantan. Of popped into Kakaban to release the hatchlings at night. The delegation fam trip is a stop to Maratua in the morning. 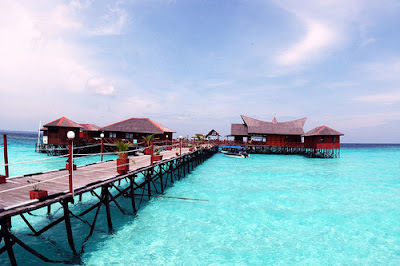 This is the biggest island in the Derawan Islands and has four villages. In contrast to Kakaban within 1 hour by using a timber ship from Maratua, uninhabited, Maratua island inhabited by about 3,168 people. "Wow, crystal water. Beautiful!" Aaron said Kevin of Travel Industry Trainee. "Cool, clear water every day. But this is perfect," said James William Hunter Valley Tours. Yes, all Caucasians Australia, reluctant eyes flashing. Crystal clear seas with crystal-like water so unsightly. Did not take long, all spraying water. "The difference with the other islands, swim or snorkel in Maratua, we do not see the reef. Just sand beach at the base of the water and turtles. It's one of the best spots to swim," said Memed, a tour guide from Paradise Derawan explained. Pricing for stays at Maratua Paradise Resort: Rp. 660,000, - per person per night for a Water Villa, and Rp. 550.000, - per person per night for a Beach Villa. The rate includes three meals a day. Check the price in advance as it can change in the high season. From the airport Tanjung Redep Berau to Tanjung Batu, when a gang can rent a car, Round-Go (delivered and picked up when returning) around Rp. 800.000, - for the car capacity of 6 persons. The best time to visit Maratua among others in the March to May, after August, early October. While at the end of October is usually already entered a period of frequent rains. 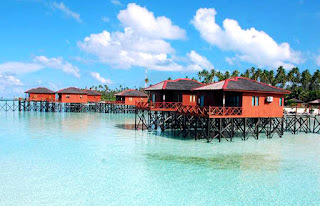 Alternative cheap lodging in Maratua: Ananda Hotel with rate: Rp. 200.000, - per room (no air conditioning) and Rp. 300.000, - per room AC. Ananda Hotel is located about 15 minutes away by bike from Maratua Paradise Resort. But the view at Ananda are very different from those in Maratua Paradise. I recommend at least stay one day only in Maratua Paradise Resort.